Tucked away in a former high school looking over the hills of Halifax sits the set of the latest series of Ackley Bridge. The Channel 4 drama first hit our screens last year and centres around a fictional Yorkshire town and its racially divided school. The show followed the lives of the local community as two schools, one predominantly white and one predominantly Asian, merged to create a new academy, Ackley Bridge College. 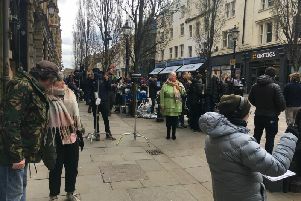 There will be plenty of chances to spot familiar streets and local locations as once again the series is filmed in and around the borough, with crews spotted in Halifax town centre a number of times since filming began at the start of the year. The scenes that take place at the school are filmed on the site of the former St Catherine’s High School in Holmfield. The original building is as it was when the school closed five years ago but inside, bright colours shine on the walls of the classrooms and corridors and the Ackley Bridge College logo makes it feel like you are walking the halls of a real school. When the bell rings on the start of a new term next week, students will be flooding back through the school gates for more laughs, tears and, of course, drama. The head of Ackley Bridge College is Mandy Carter, played by Jo Joyner, a driven woman who is passionate about seeing pupils thrive. Last series focussed on her role taking the reigns of the new school as well as her turbulent relationship with husband Steve Bell, played by Paul Nicholls. This time around there will be a focus on Mandy doing everything she can to attract more new pupils to the school, and the story will also delve a little deeper into her past. At the end of the last series it was revealed at a school open day that head teacher Mandy and school sponsor Sadiq Nawaz, played by Adil Ray, were having an affair. This is where Sadiq’s story picks back up. “We’re back but clearly there’s a bit of tension between Mandy and Sadiq,” Adil explains. “It’s connected to the affair they had but there’s tension in the work place as well with them both this series with Sadiq almost not wanting her around. Adil is a former student of the University of Huddersfield and says he felt at home during filming. “I’ve really loved Halifax this time around,” he said. “I’ve managed to have a day off here and there and have a little wander round. I’ve been to fantastic places like ‘the Piece Hall’ and ‘Square Chapel Arts Centre’. During their time filming in Calderdale the cast live in Hebden Bridge and for most it has become a home away from home. Poppy Lee Friar and Amy-Leigh Hickman, who play Ackley Bridge students, neighbours and best friends Missy Booth and Nas Paracha, live in apartments in the town. “When you’re away for six months or a good few months at a time, you really can immerse yourself in a place and get to know it, and feel like a local. Series one saw a lot of ups and downs for the friends with Nas coming out as gay to her mum and Missy trying to bring her family back together follow the death of her Nana. This series will see them both take on some more dramatic storylines but also have lighthearted moments. The pair are both originally from the South and found documentary series Educating Yorkshire useful when learning to do a Yorkshire accent for their roles. “It’s great for character as well!”, Poppy added. The latest series of the drama is back for 12 new episodes, double the length of series one, and there will be plenty of chances to learn more about each of the characters. One of these characters will be Kaneez Paracha, played by Sunetra Sarker. She is Nas’ mum in the series as well as a school dinner lady and force of nature. When returning to Ackley Bridge, the people of Halifax were useful tools to help get back into character. There are testing times ahead for the Paracha family as they uncover a family secret, but last series had its fair share of revelations as Kaneez’s daughter Nas told her she was gay. “It was a great opening issue for her to deal with. What a way for you to find out how a character works,” Sunetra said. “I was so, so astonished at the response from that episode, not only from Asian women but from British women who stopped me in the street. When playing the teachers of Ackley Bridge, the actors were able to draw inspiration from their own school pasts. “I had a couple of great female teachers when I was at school, one taught history and one was my form tutor who taught English and they were just really sound women,” said Liz White who plays English teacher, Emma Keane. In series one, Emma had a lot to deal with as her daughter Chloe turned up on her doorstep causing trouble. This series will see her battle with Mandy over the importance of art subjects as well as try to understand her feelings for fellow member of staff, Sami. Ackley Bridge will return to Channel 4 on Tuesday, 5 June at 8pm.